Anne, a 48 year old, single, mother of two, visits her GP surgery as she feels unwell and has a productive cough. 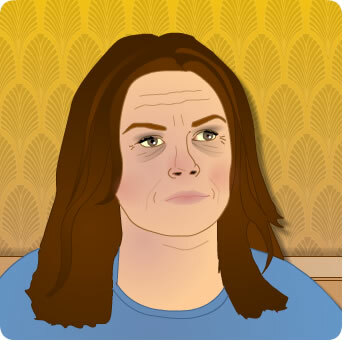 Anne finds life difficult, living in a deprived estate in Glasgow and bringing up her teenagers on her own. Anne is seen by Heather, the Practice Nurse (known as Nurse Heather). Anne is prescribed an antibiotic for a chest infection but ,while she is in the consultation, the computer flags that Anne's Blood Pressure (BP) is due to be checked. Nurse Heather asks Anne if she feels like having it checked today. Anne is happy to take the opportunity, as she has ignored a couple of letters requesting she visits the practice for a BP check. Anne's BP is 142/90 and her pulse is 70 and regular. Nurse Heather explains that her BP may be a little raised because she is feeling poorly and suggests she comes back in a couple of weeks to have her BP rechecked. Anne is happy with this and accepts Nurse Heather's offer of an appointment for a cardiovascular disease (CVD) assessment. Nurse Heather offers Anne information about the assessment (in some places this may be a Keep Well assessment) so that she knows what to expect at her next visit. SIGN guideline 97: Risk estimation and the prevention of cardiovascular disease recommends every one over the age of 40 should have a CVD risk assessment every 5 years. Keep Well criteria would mean Anne may seem a Keep Well nurse in her area.